The Pioneer Award acknowledges extraordinary contributions to advancing the nonfiction form and providing exceptional vision and leadership to the documentary community. 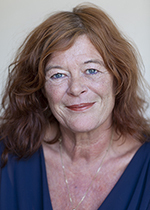 This year, the Pioneer Award will be presented to Ally Derks, who in 1988 started the International Documentary Film Festival Amsterdam (IDFA), and became IDFA’s director the following year. What started as a small gathering of documentary lovers has become the largest documentary festival in the world, including the three industry components: IDFA Bertha Fund, the FORUM and Docs for Sale. Derks has been on many juries, amongst others in Sundance, Krakow and St. Petersburg. Over the past years she has won several awards for her contribution to the documentary field, such as the Lifetime Achievement Award at DocAviv in Tel Aviv (2007), the Doc Mogul Award in Toronto (2011) and in 2015 she was made a Chevalier dans l'Ordre des Arts et Lettres.